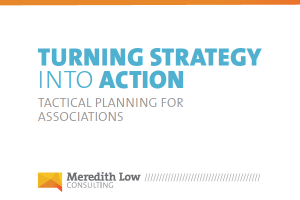 This white paper, “Turning Strategy into Action: Tactical Planning for Associations“, is for association leaders who want to make sure their strategies become reality. Connecting high-level strategies to real-world operations through tactics. Bringing tactics together into a coherent, feasible—but still inspiring—plan. Using the plan to manage expectations—and make space for opportunities. Download here – and if you’d like to talk more about it, please get in touch.